Modern, fully self contained flat up one flight steps on site of owners own property. Set on hill overlooking Tawa one way and native bush and pines the other. Deck gets morning sun and flat gets all day sun. Parking available on private drive. Welcome to borrow golf clubs. Approx. 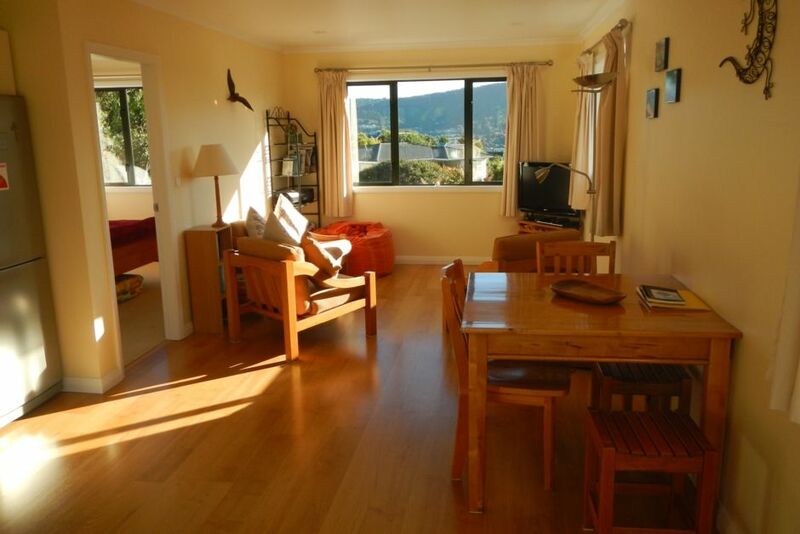 15-17 min drive to Wellington City( off peak), 20 minute walk/5 min drive to Tawa shops(Woolworths, post shop, take aways, other local shops)Dressmart, swimming pool and 30 min walk/8 min drive to Porirua where there is an indoor shopping mall, cinema, leisure centre. Linden railway station with trains running regularly to Wellington is approx. a 12 to 15 minute walk down hill. Sea swimming - Titahi Bay, Whitiriea, Oriental Parade, Plimmerton, Petone. Washing machine and tumble dryer are shared by owners. Gorgeous views from the deck at the back of forestry, bush, greenery and hills. The views at night and day from the front windows is beautiful. Provided everything you needed and more. This was a gem worth finding. Fantastic host ! Helens flat is a flat with beautiful views and perfect solitude had a great week ! The flat was separate from all great place quit and very clean all was perfect for our stay was like home away from home ! 15 min cruise to Wellington also was perfect created that out of town feel we loved it! Definitely would return ty Helen! Lovely, clean, beautifully presented and airy one-bed apartment. Lovely, clean, beautifully presented and airy one-bed apartment. We liked the location since it's a quite 17-18 min train ride to Wellington central. It was very quiet and peaceful. Much appreciated. Lovely clean, tidy and warm accommodation. Lovely clean, tidy and warm accommodation. Everything you could need is provided. We would happily stay again. The house was in excellent condition, had everything I needed. The house was in excellent condition, had everything I needed. Very clean and well maintained. Really good, I would definitely stay again. Location very handy to the train and plenty of shops nearby.